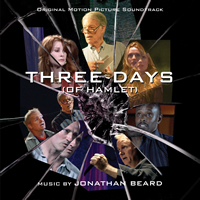 BUYSOUNDTRAX Records presents the original soundtrack to THREE DAYS (OF HAMLET), featuring music composed by Jonathan Beard for the 2012 docudrama directed by and starring Alex Hyde-White, along with Tom Badal, Richard Chamberlain, Iva Hasperger, Stefanie Powers, Chuma Hunter-Gault, Peter Woodward, Joseph Culp, Jenna Brighton, Liane Curtis, Keith Ducklin, Brian Keith Gamble, David Mayhan, Sam Meader and Nicolas Porcelli. THREE DAYS (OF HAMLET) documents the events surrounding a troupe of actors and others as gather to rehearse and perform a stage reading of the famous play in only three days. Reality intrudes as they come together and strangers bond, as in war. Without a net, they galvanize during rehearsal while the lead actor and manager, both as himself and his character of Hamlet, grapples with the unexpected task of coming to terms with his powerful and famous father. A 'cliff notes' examination of one of the best plays ever written by the best cast they could find, including three famous sons of three very famous actors. As the lives of the players juxtapose over their characters, what results is a fascinating look at how, once again, art illuminates life. By holding the mirror up to ourselves, we illuminate the world around us. To score this unique film, Jonathan Beard produced an equally unique score, a fusion of subtle electronic sound design and analog synthesis, acoustic chamber orchestra, and English musical forms from Shakespeare’s time hybridized with modern scoring aesthetics. Jonathan Beard composes, arranges and conducts music for visual media, albums and the concert stage, and is based in Los Angeles. He received his BA in Music Composition from Stanford University, studying with Mark Applebaum and Brian Ferneyhough and earned his MA at UCLA studying with Roger Bourland, David Lefkowitz and Paul Chihara. Combining a unique aesthetic of symphonic depth, emotional nuance and quirky boutique electronics, his work can be heard across broadcast and cable television and in both short and feature films. His work has been commissioned and/or premiered by an eclectic group of ensembles and organizations, including the Pacific Symphony of Orange County, the Grammy-nominated St. Lawrence String Quartet, the YMF Debut Orchestra, Grammy winner Vince Mendoza, and the Los Angeles Master Chorale Chamber Singers, among others. Beyond composing, Jonathan has orchestrated and arranged music for films for studios such as Warner Brothers, Disney, and Sony, and TV shows on all major broadcast networks. His concert arrangements of music by other film composers have been heard live in Europe, Africa, and the Americas. Also highly committed to music education, Jonathan has taught electronic music composition and technology at UCLA, lectured on behalf of the Pacific Symphony and the Los Angeles Philharmonic and presented papers on film scoring and electronic music production at numerous conferences. BUYSOUNDTRAX Records presents THREE DAYS (OF HAMLET), featuring music composed by Jonathan Beard. The booklet includes liner notes by actor/director Alex Hyde-White and composer Jonathan Beard. THREE DAYS (OF HAMLET) is a limited edition release of 1000 units.